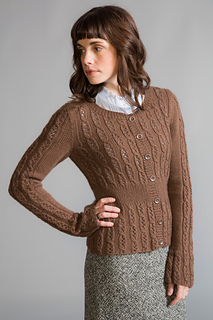 A classic round neck cardigan covered in eyelet filled cables. 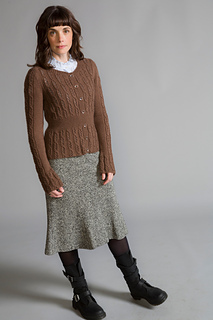 A ribbed panel defines the waist and the sleeve cuffs feature a bell shape. Knitting needles in size US 5 (3.75 mm) or size to obtain gauge. 24 sts and 32 rows = 4” in patt from Lace and Cables chart using larger needles; 22 sts and 32 rows = 4” in St st using larger needles. Take time to save time, check your gauge.